Eine ganz, ganz tolle Tour und herrliche Aufnahmen! Ancient Tibetan farm land without any vehicle traffic is surrounded by magnificent mountain scenery in Nar-Phoo; Kang La provides a spectacular view of the entire Annapurna range. The region Nar-Phoo was opened for foreigners only at the beginning of this century. Even today the number of trekking groups is still small. Your will follow old trails and foot paths, where goods are transported on mules and donkeys or by human porters only. The landscape is dominated by snow-capped peaks which are more than 6000 and 7000 meters high. Embedded there are deep-cut valleys with narrow river terraces, where in former times irrigation fields were cultivated up to an altitude of 4300 meters and higher. Today many old settlements are abandoned and only very few villages are still inhabited all year round. Local culture is Tibetan to a large extent, but it unfolds its own and distinct characteristic: Yak meat from fresh slaughters for example is on sale in Phoo quite frequently. Similar to Upper Mustang ancient and modern elements of live co-exist side by side: While in the entire village of Phoo running water is available only at a few communal wells, mobile phone coverage extends far beyond the remotest houses. Nar-Phoo is suitable as a trekking destination on its own or as extension of the “classical” Annapurna circuit. Those who are ready to cross the challenging Saribung pass can even combine Nar-Phoo with a visit of Upper Mustang. (1) In Phoo you should not miss to climb an approx. 4500 m high mountain which offers a spectacular view of the village from above and a great panorama. 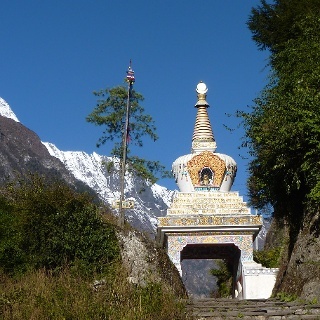 You start the ascent at the western end of the village and pass by a small Gompa on a hill. An old trail leads steeply up on to an abandoned hamlet. There you turn to the next mountain ridge in the west and climb on it straight up to some prayer flags at the summit. 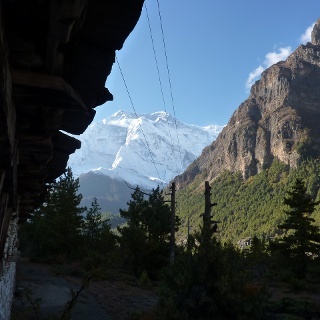 (2) To enjoy the spectacular Annapurna view from Kang La unrestrictedly, you climb at the west side of the pass approx. 70 meters higher to reach a small rocky summit, which rises directly above Kang La. (3) At the end this tour a visit of the hot springs in Chame is worthwhile. You find the springs down the valley at the left riverside behind the last lodge. After a week or more without a shower it is really wonderful to enjoy warm water in a bricked pool. This trekking tour does not entail any specific risks, altitude acclimatisation has to be observed closely though. After heavy snow fall Kang La can become impassable for a few days. Nar-Phoo is a „restricted area”: For a visit a special permit is required, which must be obtained in Kathmandu in advance. This permit has to be issued for at least two persons, their physical presence is not verified though. You can thus travel as a single person and pay for two participants. An authorized trekking guide is mandatory for Nar-Phoo. Every backpack should contain: Protection against rain, cold weather and sunburn, a first-aid-kid, sufficient drinking water and a trekking map. 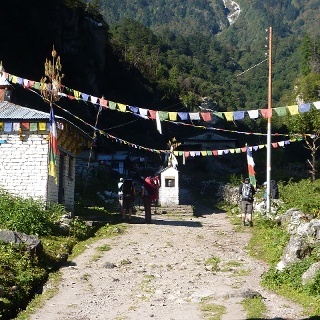 It is possible to visit Nar-Phoo as „lodge trekking“, but accommodation is available only in Meta, Chyako, Phoo and in Nar. Flexibility thus is limited in this case. Fully equipped camping trekking is therefore recommended for a visit of Nar-Phoo. Nar-Phoo can be combined with the crossing of Saribung La/Mustang La and a visit of Upper Mustang. You can also extend your trip to Nar-Phoo by a visit of the area around Nagoru or an attempt to climb mount Chulu Far-East after having crossed Kang La. For further information please contact Langtang Ri Trekking & Expedition P.Ltd. Along the riverside of Nar Khola the route is rather flat up to the first river crossing over a suspension bridge. Behind the bridge a short steep section uphill follows, after that the trail leads up and down, now on the (true) left side of the river. You will pass two camp sites on the way, which both are quite small and not really inviting. After another river crossing the trail get flat again until you arrive at the next suspension bridge to cross Nar Khola again. Starting directly at the concrete basement of this bridge a small path leads to a hot spring. First you descend from the bridge to the ground level using a traditional climbing tree, where you follow a faint trail. After some 150 meters you climb over a rocky terrace to arrive at a small ravine. Close to the riverside hot water pours out below a steep cliff. Unfortunately this spring is too small to take a bath. Further up the valley the trail passes a water fall at its back side, which provides a spectacular view through falling water. Soon afterwards you arrive at Dharamshala, where you find a camp site with a simple tea house beside. Immediately behind Kyang the way leads steeply down to the riverside and follows the valley which gets soon rather narrow. At an old bridge you could cross the river to follow a flat, but rather rocky and uncomfortable trail at the other side. It is more convenient to stay on the main route, even though it includes several steep parts uphill where rock walls have to be circumvented. Eventually you will pass a few Chorten and arrive at the low end of a gorge, which has been cut out by the river Phoo Khola. A steep ascent leads up in close turns to the plateau of Phoo where you arrive at an entrance gate. Behind the gate you pass a long mani wall, before a long suspension bridge leads to the village Phoo on the other side of the river. In the afternoon of this day you can do the suggested climbing above Phoo to get a special view. This rest day can be used to explore Nar and its surroundings. Kathmandu (11-12 hours in total). From Kathmandu via Mugling to Besisahar in a regular car or bus (driving time 4.5 - 5 hrs). From Besisahar to Koto/Chame on a very difficult 4x4 track, where only local vehicles are operating (driving time 8-9 hours uphill and 6-7 hours downhill). It is thus possible to drive in one day from Kathmandu to Koto and from Chame back to Kathmandu at the end the trip, however this is really strenuous.